This massive bestiary clocks in at 199 pages, 1 page front cover, 1 page editorial, 2 pages ToC, 6 pages of SRD, 2 pages blank, 1 page back cover, leaving us with an impressive 186 pages of content, so let’s take a look! We kick off this bestiary with an interesting introduction, one, in fact I feel the need to mention: The genesis of this book is uncommon. Once upon a time, Purple Duck Games released small monster pdfs, where patrons could choose old-school monsters to be updated to PFRPG – alas, the small pdfs didn’t catch and so, instead, this massive book became a flicker in the eyes of the creators. As you probably can imagine, a monster book ranks among the most expensive things you can do as a publisher, with artworks clocking in among the most expensive components in any rpg-product. Thus, this one went on the back-burner and PDG slowly, but steadily, acquired the funds (all sans kickstarter, mind you!) and crafted this massive tome. Since then, some of the artworks commissioned have been sold to other 3pps for use, so here and there, avid readers of 3pp-material may stumble across a piece of artwork already known – well, this book is where they were supposed to show up in the first place. As always with monster books of this size, I will not do the math for each and every statblock – instead taking a broader look, checking here and there and looking for obvious glitches, flawed formatting or those that impede the game – like badly worded signature abilities, non-sense types and the kind. Got that? Neato – It should also be mentioned that the monsters all come with a small paragraph that tells us about their role on the world of Porphyra. Now the first creature herein would be looking like a bird – the Alaihar, a small CR 10 avian creature with majestic, iridescent wings – that actually is a dragon! No, seriously – including breath weapon, interesting spellcasting (both sorc and cle-lists), this sacred bird makes for an interesting ally for good PCs and a cool twist of the holy bird-trope. Now if the gods of good are angered, their wrath is all too often downplayed – enter the alticorns of Idumea, gargantuan, equine beasts of righteous wrath, these beings can crash castles – 1/turn dealing x10 damage to objects and structures makes them fearsome bringers of ruin indeed – especially since they also are rather adept at sundering objects… OUCH! Speaking of ouch – yes, there is a concise table to create amalgam creatures, with types being determined by awesome ranks – which reads more fun and insincere than the concise template should – for actually making ooze/outsider-combinations and the like, the template is nice, though *personally* I would have preferred a slightly more stream-lined, simpler template here or a more complex one, but either way, that’s a personal preference and will not influence my final verdict. Now if a certain anubis-headed race has been missing from your game ever since Arcana Evolved, you’ll notice that there also are a bunch of humanoid races in here, one of which, the Anpur can be considered the heirs to the Sibeccai. 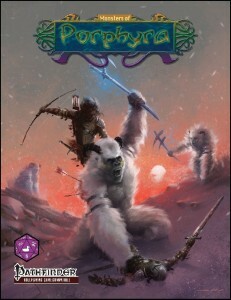 Races like the yeti-like Ithn’ Ya’roo, the four-armed sabertooth feline Knük or the ogrillons – the races in here tend to fit some classic niches and should make some of the readers positively nostalgic. Now if you prefer some more apocalyptic creatures, this is the book for you: Whether it’s truly apocalyptic creatures (via the new template), remnants of a by-gone age can also be created via another template – for two truly dastardly killer-creatures indeed. Have I mentioned that Fenrir is in here as well? If you want to go Giger/need beings from the cold expanses of space, the void-creature template should cover that itch. The pseudonatural creatures have also been updated, but changed dramatically from previous incarnations – no longer true strikes, but instead a changing of shapes. Paragon creatures also make a return – with optional mythic rules! Neat! Better yet, the sample paragon flumph gets up to CR 7/MR 3 and also comes with a full-blown origin story – which is rather awesome! Speaking of old favorites – a template-based version of creating beast lords can be found herein as well. Vampiric dragons and vampire thralls are back – though the dragon’s former treasure-hoard dependency is gone. Also: The stake-weakness doesn’t make much sense to me in the case of vampiric dragons, so overall, this template could have used some more specific divergences to help drive home the uniqueness of the undead apex predators. Not sold on that one. Magical constructs and even transformer-style constructs can be created via the material herein as well. Beyond templates like this, we also get quite an array of fey – like the regal fey, the Njuzu, the new imperial jade dragon or the magi dragon – the apex predators also have a selection of dragon-hybrids and lesser versions like dragonnels, scorpion/dragon hybrids and similar classics you might know from previous editions – with respective, new, unique rules-representations. If you wanted the eye-beasts to return – they are back in these pages as well – as are the crystalline horrors, gem golems and beholder related beasts that can somewhat fill the void of these ip-closed critters. It should also be noted that a new devilish archdevil-level creature can be found herein as well. Ioun remnants ( are also in here as an example of a cool, unique adversary) are also in here – and, fans of the Iron Kingdoms should take heed – the legendary Ironclad Lich gets the Pathfinder treatment herein – finally, one of the most iconic 3.X monsters back in the game! Strange creatures and beasts like the devil dogs, burrow-mawts and the like are back again as well – though personally, I would have preferred a more deadly rules-representation of the devil dog’s throat rip than making resurrection harder. Fans of Asian critters can also rejoice – fukuranbou, komori ninja and Rokurobi, for example can be found in these pages – and some of the creatures, like the earth-gliding rognak burrowers, even come with Ultimate Psionics-compatible psionics. Haters of psionics should know, though, that the pdf is not centered on these, though. What about the rather deadly stirge swarm, the memory-stealing, decapitating, disturbing and perpetually silent stillfiends? The monstrous lycanthrope template also deserves special mentioning – creating e.g. were-stirges or were-otyughs is just awesome! And yes, there also are interesting undead herein and while the barrow wight is rather bland, zombie rats, corpse orgies and similar disturbing adversaries like a hound with a cluster of maggot-like tendrils for a head also mean that aficionados of the macabre get enough food for their campaigns herein. The book also comes with a list of making monsters, simple templates, advice for monsters as PCs, a table of monster-stats by CR, universal monster rules, lists of creature types and subtypes, monster cohorts and animal companions, monsters by type, by CR and even by roles – awesome and extremely handy for getting the right creature in a pinch – kudos for making the book that user-friendly. Editing and formatting are very good, especially for a massive book of this size. Layout adheres to a neat, easy to print two-column full-color standard with one for artwork for each and every creature – even for the sample creatures of templates more often than not! The pdf comes fully bookmarked for your convenience. The design team of Mark Gedak, Perry Fehr and Stefen Styrsky deliver one massive, impressive bestiary with the art of Tamas Baranya, Jacob Blackmon, Gary Dupuis, Mark Hyzer, Matt Morrow and Tim Tyler delivering solid representations in gorgeous full color. 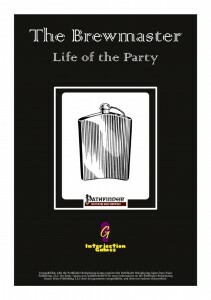 Purple Duck Games has these spontaneous inspirations, where sometimes, their pdfs come out of left field and blow your mind – and this book does reach this level of brilliance in quite a bunch of the entries. It should be noted, though, that not all of the critters reach this level of creativity and awesomeness -some of the adversaries could have used an additional signature ability or two – mainly, this is due to being creatures converted from previous editions, when it does show up – so essentially, complaining about that goes against the design intent. Still, personally, I did tend to gravitate to the creatures where PDG went all out, went utterly original. 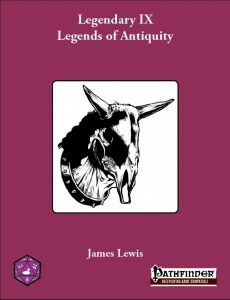 Some of the templates and creatures herein had me grin from ear to ear – and taking the extremely fair price-point into account, this bestiary is indeed a superb purchase with a great bang for buck ratio. However, one should also mention that by now, my expectations for bestiaries are extremely high -Alluria publishing’s underwater bestiary Beasts of the Boundless Blue raised the bar regarding artwork, whereas Legendary Games’ shorter bestiaries have done the same for unique signature abilities – and while the production values of this book are great, personally, I would have loved to see a bit more in the latter department – more truly unique abilities. Still, it should be noted that this remains me complaining at a high level: The respective creatures more often than not come with at least cool combinations of abilities and unique fluff, even in the case of creatures sans unique signature abilities – and hence, my final verdict will clock in at 5 stars, omitting my seal of approval by a margin. 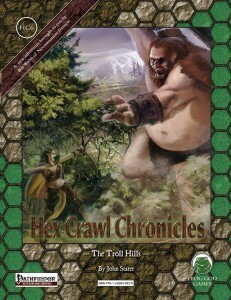 You can get this massive bestiary here on OBS and here on d20pfsrd.com’s shop! You can support the creation of more monsters for Porphyra via Patreon – here’s the link! This pdf is 6 pages long, 1 page front cover, 1 page editorial, 1 page SRD, leaving us with 3 pages of content for the new PrC, so let’s take a look, shall we? 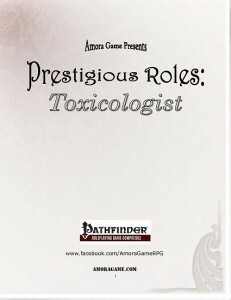 The Toxicologist needs to be non-good and have 5 ranks in Craft (alchemy), sleight of hand and stealth, 3 in heal and need to have poisoned an unsuspecting victim and made friendly contact with a poison-selling apothecary. Got that? Okay, then you qualify for a PrC that nets you d8, 6+Int-mod skills, proficiency with light armor and blow guns, 3/4 BAB-progression and 1/2 fort- and ref-save progression. Toxicologists never risk poisoning themselves, create poisons at half the time and may apply them as a move action (later even as a swift action). They may even change the delivery method of poisons and make e.g. ingested poisons contact poisons – which may be problematic, since method of delivery more often than not makes for a balancing factor in a given poison’s potency. The pdf mentions the Craft (poison)-skill, here, though – which does not exist. This ought to be Craft (alchemy). At high levels, toxicologists may blend poisons and true masters may, as a capstone, generate lethal poisons from their own body. Editing and formatting formally are good, though some of the rules-languages could have used a tighter wording. Layout adheres to a printer-friendly two-column standard and the pdf comes sans bookmarks, but needs none at this length. The toxicologist-PrC is on the one hand a great little PrC to make poison-use more viable, but it does suffer from some hick-ups in the rules-language – while none of them are particularly nasty, they do accumulate. Author Christie Hollie has delivered a nice PrC and indeed shows some talent here – with minor modifications, this PrC can make for a neat addition to one’s campaign. Oh, and it’s just 1 buck. For the very fair price and the nice concepts herein, I believe that, in spite of its flaws, I can still round this up from my final verdict of 3.5 stars to 4. Youc an get this PrC here on OBS and here on d20pfsrd.com’s shop. This installment of RiP’s Convergent Paths-series is 14 pages long, 1 page front cover, 1 page editorial, 1 page SRD, leaving us with 11 pages of content, so let’s take a look! We kick off the pdf with a simple archetype – unarmored clerics. These guys don’t get the proficiencies with armors or shields, but when not heavily encumbered and unarmed, they get wis-mod to AC and CMD, also applying the bonus when flat-footed and against touch attacks. When under fear-related conditions or confused, these bonuses are negated and they don’t stack with other wis-to-AC-abilities. Generally nice, if a bit weak – especially at medium to high levels, an additional benefit could help. The Devout Exemplar archetype loses armor and shield proficiencies and only gets one domain. Instead, they get the ability to blink to the deity’s plane for 3+Wis-mod rounds per day, phasing rapidly between the deity’s plane and the prime material. In the after math, the exemplar is fatigued for 2 rounds per round spent phasing. While phasing, the exemplar has a 50% miss chance and even this chance to be missed by targeted spells. They also have a 20% chance to miss themselves, which extends to their own spells. While phasing back and forth, they take only half damage from AoE-effects, falling etc. and they may even interact with potential creatures on that plane. Blind Fight doesn’t help against phasing, but dimensionally locking the exemplar does. At high levels, the exemplar may stay on the deity’s plane. Starting at first level, they also choose one of 3 training regimens – strength, speed or stamina. This supersedes the usual praying for spells and additionally an ability at 2nd level and every 4 levels thereafter. Beyond the general benefit of the regiment (like using class level for CMB regarding one maneuver chosen per day), these include lessened penalties for age, wis-mod to CMB 1/day/creature, vastly increased thrown weapon range (but lost str-bonus beyond increment 5), better climbing or more carrying capacity, to name a few. Exemplars devoted to speed can tumble via acrobatics at full speed at half the penalty, get better reflexes or no penalties when in tight conditions etc, while stamina training helps with armor check penalties, can lessen fatigue incurred by their blinking (or rage!) and also gets a recovery trance that lets them reroll fort-saves at +2, potentially even negating the initial failed save. The latter is a tad bit too strong for my tastes since it retcons the initial effects and has no limitation apart from one roll per condition per 24 hours. Each regiment also provides a +2 capstone-bonus to the attribute of their regime at 20th level as long as they maintain training. Finally, they get a +1 dodge bonus to AC while wearing no armor/shield, scaling up to +5. Next up would be the Missionary Priest, who also get wis-mod to AC/CMD (with same caveats) and a studied creature type (somewhat favored enemy style), but with more focused on social/knowledge skills. These races also determine when the missionary’s special abilities kick in – these are linear and offer no selection, allowing for additional AC-bonuses, 5-foot-steps, use aid another vs. AC 20 to negate AoOs and finally, faster coup-de-gracing. I like the idea here, but the execution feels a bit too linear and could have used a bit more variety. The next archetype would be the Sacerdos (plural Sacerdotes). These also get the AC/CMD-bonus in lieu of armor/shield proficiency and at 2nd level and every 4 levels thereafter, these guys and gals learn a sacred rite, which can perform as a full-round action that incurs an AoO – unlike regular channeling. Each rite allows the Sacerdos to replace a set amount of channel dice with another effect, which lasts for one round unless otherwise mentioned. Only one rite may be used to modify one channel attempt (unless you take the new Augment Rite-feat), though the rite can replace all channel dice, thus cancelling the standard (or variant) channeling effect the act would usually result in. The channel effects can improve/hinder critical hit-confirmation, render foes blind/dazzled, grant energy resistance and a whole slew of other cool, tactical options. All in all, one damn cool archetype, though I wished it had much, much more rites available – for more versatile builds. This one’s definitely a candidate for a full-blown pdf of its own – perhaps with divine channeler-synergy?. The new feats allow the respective archetypes to e.g. wilder in other training regimes, get more rites, target creatures excluded with selective channeling with other effects, partial access to (sub-) domains etc. – some coolness in here, especially if you wanted more synergy with variant channeling – all the metamagic fun etc. is in here – at times balanced by e.g. staggering you or in the case of maximizing the effect, limiting the channel to you. One feat hit a pet-peeve of mine – as a swift action, it buffs your weapon and makes it aligned, which is very strong – especially since the feat has NO LIMITS. Some generous, but existing limits or the alignment effect coming it at higher levels would be very much prudent in my book. Editing and formatting are very good – I noticed next to no glitches and those I found were typos and didn’t impede my ability to understand the content. Layout adheres to RiP’s old two-column full-color standard. Artwork, as far as I could tell, is thematically-fitting stock art and the pdf comes fully bookmarked for your convenience. Thomas LeBlanc is a talented designer – when I read this, I expected yet another slew of uninspired cleric/monk rip-offs, but instead, he delivers! The Divine Exemplar’s blinking, the Sacerdotes and their rites – I love those two to death (they could imho carry their own books each – and would deserve more fodder!) and the channel-themed feats are also nice additions to the game. I was quite disappointed by the missionary, and I do consider some minor pieces of crunch to be somewhat problematic – these remain the absolute minority, though. In the end, this pdf misses the 5 stars only by a margin, resulting in a final verdict of 4.5 stars, rounded up to 5 due to the low, fair price and the nice fluff that kicks off each feat, each archetype. Now when do the exemplar and sacerdotes get more tools? 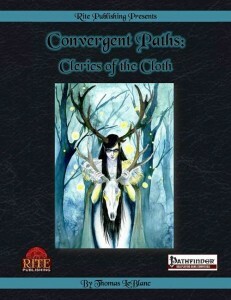 Youc an get these cool archetypes here on OBS and here on d20pfsrd.com’s shop! 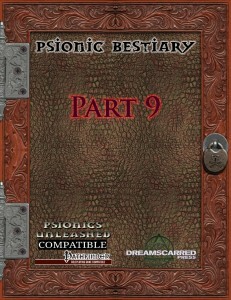 The 9th part of the Psionic Bestiary is 10 pages long, 1 page front cover, 1 page editorial, 1 page SRD, leaving us with 7 pages of content, so let’s take a look! We kick off this mini-bestiary with a new CR 5, tentacle-mouthed monstrous humanoid with emergent brain lobes, the Brataurus, who can emit wis-damage dealing screams and worse, they actually feed on said damage, healing themselves. Cool! The CR 3 Dedrakon, a scaled predator that adds crystal shackles to their prey via their attacks, which increase in movement-hampering potency the more creatures are shackled with them – oh, and they can emit roars to paralyze shackled foes on a failed save – throw these in groups, add some hit and run-tactics/feats and watch them squirm. And yes, the base creature is inspiring enough for me to actually do that. At CR2, the 3-eyes lizard-like Dulah-humanoids have a nice ability – they can barf their treasure at foes! Since my version of the dire beaver barfed splinters at foes, yes, I do like that one! At CR 6 and 8 respectively, the Ensnared Earth Elementals and their Greater cousins are glorious – part elemental, part plant, they may strike through stone and ground those nasty fliers with psionically chargeable pulses of gravity! Awesome! At CR 2, the somewhat ferret/cat-like Ferax have some nice minor psi-like abilities and can emit bolstering hums. Finally, at CR 3, the bat-like, winged, one-eyed Reva can manipulate objects, target foes with force damage and are superb spies indeed that can detect sentient, sapient life-forms. Nice spies for the BBeG – or your PCs, for these “builder bats” are actually LN and rather intelligent! Editing and formatting are good, though I did notice minor typo-level glitches, nothing rules-problematic. The pdf adheres to DSP’s 2-column full-color layout, with bookmarks being there, but broken (and unnecessary at this length) and the artworks for the creatures, all in full-color, being simply WEIRD and awesome. Add to that the lack of glaring glitches in the math – and we also get in that department, one damn impressive little bestiary! Authors Jeremy Smith, Andreas Rönnqvist, Dale McCoy Jr. (commander in chief of Jon Brazer Enterprises) and Jade Ripley deliver a bunch of psionic creatures that are just fun – each one coming with at least one cool signature ability and production values to supplement their unique abilities as well as with the more than fair price point, this bestiary can be considered 5 star material indeed – which also reflects my final verdict, omitting my seal only by a margin. You can get this nice little mini-bestiary here on OBS! I seriously enjoyed the brewmaster, its unique mechanics, the nice descriptions and its unobtrusive humor – and consider it a great addition to the game…but one that has some minor glitches, as mentioned above. While no deal-breaker, they keep the class from the highest honors, making me settle on a final verdict of 4.5 stars, rounded down to 4. This installment of the advanced races-series is 17 pages long, 1 page front cover, 1 page editorial/ToC, 1 page advertisement, 1 page SRD, leaving us with 13 pages of content, so let’s take a look! 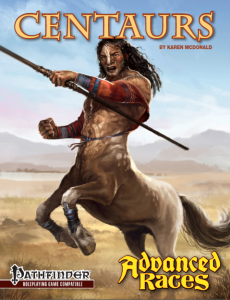 As has become a tradition with the series, we kick off by examining the customs, tribal lands and culture of the race in question and as has been the custom, the prose is glorious – author Karen McDonald explains different breeds, customs and lands and vivid prose, including sayings and teachings and a concise look at general psychology of the centaurs, their relationship with other races, all in the context of the delightful Midgard-setting – but can the rules back this up? Centaurs get +2 to Str, Wis and Con, -2 to Int, are large, get a base movement of 40 feet, darkvision 60 ft., run as a bonus feat, count as having the mounted combat feat for purpose of skill prerequisites (but may not use ride to avoid damage to their equine halves), but strangely get +2 to ride-checks and attack rolls when charging. They also get +4 to CMD versus trip and -4 to stealth due to being quadruped and they also get +2 to craft (bows) and heal. I know. Here I go again. Soooo, as quadrupeds, do centaurs use quadruped rules to determine carrying capacity? Why do they have the ride-check bonus? Where is the size, height and weight-table? Worse: Undersized weapons ability, anyone? As large creatures, these centaurs, unlike those in the bestiary, can use large weapons. The variants are medium, so that doesn’t extend to them, but still. Next up would be traits – Status-bonuses when interacting with fey are nice, but where things get weird would be with Born of two hordes-trait – this allows you to take to traits that are assigned to specific hordes – which per se is fine. It does specify, though, that this breaks the rule that one can take no two traits from one category. Yeah. Here’s the cincher – the traits universally lack categories – they all just are “traits”. While assigning (combat) or (faith) and the like should not overexert anyone, it’s still quite an oversight. On the cool side, we get a trait that offers the option to choose a raccoon-dog as a familiar or a dire weasel as an animal companion, with full stats for either…AND including the familiar bonuses/mini animal companion statblock! Two thumbs up, Mrs. McDonald! We also are introduced to 7 new feats for faster movement, secondary hoof attacks or even a trample attack. two feats deserve special mentioning – one lets you increase casting time x2 in exchange for +2 to CL and the other lets you 1/day recall a spell you’ve already cast as a swift action, but only of a level -1 of your currently highest available slot. Both have in common that their wording is relatively concise, but also that they have the [magical]-feat-descriptor that to my knowledge, doesn’t exist. Still, not a reason to bash on these, even though one feat (+1 atk, damage, skill+ ability-checks and caster level checks in forested environements) feels like filler. We also get 3 archetypes – the Green Witch (guess for which base-class) can increase or decrease the fertility and productivity of areas by pronouncing blights or blessings and instead of a 4th level hex, gains the ability to use the equivalent of summon nature’s ally,s caling up with her levels. On the nitpicky side – I assume they follow the default hex-rules, since both abilities lack information as to what action they require to activate. Explicitly stating that they count as hexes would have been prudent. A lost chance – blight/blessing SCREAMS Kingmaker-style kingdom-building rules – some precise rules for use of the abilities in that context would have been awesome. Fighters may opt for the Oyun Wrestler archetype, who doesn’t get proficiency with shields and heavy armor, but instead improved unarmed strike and the new iron hooves feat at first level. They also get scaling dodge bonuses and may treat hooves as primary natural weapons and finally, they become excellent in tripping foes. Okay, if rather weak archetype – can’t see my players choosing this one. Oracles may opt for the path of Redegiver, who may communicate with equine beings and perform a special kind of augury by galloping alongside equine hordes – while again, none too strong, a very interesting, flavorful archetype that drips roleplaying potential. We also get 4 new spells – let’s start with the cantrip: Thundering Hooves lasts one round, requires a swift action, and increases your movement by 30 feet when charging. When taking the run action, it multiplies speed by +2, so x6 movement instead of x4. This is too strong for a cantrip. Also, the cantrip refers to itself as gallop in the text. The level 1 version lasts longer, but why cast it? A thrid spell extends to multiple targets and a fourth targets multiple creatures as well as allowing them to ignore difficult terrain. Horseshoes of lightstepping (and their greater cousins) would also be rather awesome – they make the centaur lighter. Alas, we have no idea what a centaur weighs… We also get 4 rather awesome mundane pieces of equipment. On the final page of the book, we get two variants of centaurs with the elf/deer-hybrid Alseids (+2 Dex and Wis, -2 Int, low-light vision, +1 DC against Old World-spells, trackless in woods, quadruped, spears/shortbow familiarity, +2 to perception and stealth) and the onager-based Oinotaurs, who get +2 con and either +2 Int, Wis or Cha, -2 Dex, lo-light vision, Gang Up as a bonus feat and count as having mounted combat prerequisite-wise, +2 to a knowledge skill of their choice and all knowledge skills as class skills, familiarity with short swords and halberds and the usual quadruped bonus versus trip and the increased speed. Editing and formatting, while not perfect, are much better than in the last installment and overall can be considered good. Layout adheres to Kobold Press’ beautiful two-column full-color standard and the pdf comes with gorgeous artworks, though fans of Kobold Press will have seen them before. The pdf comes fully bookmarked. So Centaurs are a tough sell on me as a player race, mainly because their size and anatomy poses problems with many obstacles that standard modules tend to presume – e.g. climbing ladders or crawling through tight spaces. The belt herein gets rid of these issues and for that item alone, anyone even remotely intrigued in the concept should take a look. It should also be noted that the crunch herein is free of any truly greivous, glaring glitches and that the wording is much more concise than I expected. I haven’t read any supplement by Karen McDonald before and she did a good job indeed, one well worth keeping an eye out for. That being said, the lack of an age, height and weight table is particularly irksome when taking a look at two of the magic items that address said weight-issue. I can’t fathom why the table wasn’t included. The second serious hickup would be that, beyond the centaur (and oinotaur) being slightly too powerful for my tastes, the former doesn’t get the undersized weapon quality. This is a serious oversight that should be rectified. All complaining aside, this is the best advanced races-supplement since Ben McFarland’s take on the Darakhul, on par with the installment on Ravenfolk and well worth a final verdict of 3.5 stars, though, due to glitches, I’ll for now round down to 3 for the purpose of this platform. You can get this neat supplement here on OBS. The ninth installment of Purple Duck Games glorious series of magic items that scale with levels clocks in at 32 pages, 1 page front cover, 1 page editorial/explanation of basic rules, 2 pages of SRD, leaving us with a massive 28 pages of content, so let’s take a look, shall we? In case you’re new to this – legendary items as per this series are magic items with an extensive, well-written background story. These items feature prerequisites in order to unlock their powers. The items per se scale with the character level of the wearer, thus making for a neat way to combat the christmas tree syndrome – and thus see excessive use in my games. They usually have either a 5-or 10-step ability progression, with miscellaneous items usually getting the former, while weapons, armor etc. get the latter progressions. All right, so how do we start? Well, we kick off with the perception-improving, movement-impediment negating battle-mask and then get a bladed bracer. What’s that, you ask? Well, first of all, an interesting off-hand weapon and secondly, a weapon that nets you a ton of feats when using the bracer – rather cool item-class! The headband of deathless devotion called vesture of Ahusye not only looks damn cool, it also gets an auto-resurrection capstone – yeah! Or would you rather prefer a cestus that can punish the wicked, even pulverize them, even, a limited time per day, turn botches into successes? Yeah! Foes of humans may enjoy the new, lethal fanged bracers and their necromancy-effect duplicating tricks. More heroic people (of dubious origins) may enjoy a new punching dagger sworn to destroy all evil, devils in particular. What about a cold-iron flail that delivers some wildcard-feat style selections and counts as a size larger thanks to its kinetic enchantments? What about an elven ioun dagger of obsidian that makes for a neat tool not only for scoundrels, but also for casters? Do the words “Ah, fresh meat!” still send a shiver down your spine? If so, the greatcleaver weapon class and its legendary version are just what you want to wield and not end on the other end off – yeah, the Diablo-Butcher-weapon-class has found its way within these pages. A Ninja’s new best friend would be the legendary bladed tonfa herein, studded with SPs galore. And if you ever thought that the boss of the first Kingmaker module required a proper item (or if you roll that way with the fey – erlkönig-style), then you’ll be happy to know that yes, a stag-antler studded magical mask can be found within the pages of this pdf as well. Always wanted that damn cool lethal throwing axe? Well, you’re in luck, for one herein exactly fits that bill! Clerics will in the meanwhile learn to appreciate a new mace herein, which nets them quite an impressive array of channel feats, leaving precious feat slots for other choices. Characters more in line with the “God punishes, I kill”-notion of the sacred assassin will enjoy the new katar herein, while a new sickle and an ioun club make for tools for those more in line with nature’s forces. You may also wield all that remains of a solar’s noble sacrifice in the form of a trident – one that may look evil, but which is suffused with divine power indeed. Editing and formatting are very good, I didn’t notice any significant glitches. Layout adheres to a printer-friendly 2-column b/w-standard and each item herein gets its onw, neat b/w-artwork. the pdf comes fully bookmarked for your convenience. Author James Lewis delivers a neat host of weapons, one themed mostly about slaying evil – with quite a few holy weapons herein, Wrath of the Righteous heroes will probably find quite an array of exotic, cool tools to destroy their dread opposition. (And it should be mentioned that I’d take PDG’s scaling legendary items over those introduced by Mythic Adventures any time of the day!) Overall, the items herein show interesting, versatile background stories and abilities -though the latter are a bit more on the conservative end of the spectrum, with many feat/SPs granted by the armory. While that is no way bad, personally, I would have enjoyed slightly more unique abilities – then again, that’s nitpicking at a high level. James Lewis did a fine job with this installment of the Legendary-series, one well worth a final verdict of 4.5 stars, rounded up to 5 for the purpose of this platform. Go forth and conquer evil! You can get this neat collection of scaling magical items here on OBS and here on d20pfsrd.com’s shop! This small pdf by Gaming Paper is 8 pages long, 1 page cover, 1 page editorial/SRD, 1/2 page empty, leaving us with 5 1/2 pages of content, so let’s take a look! DISCLAIMER: As a short look at the editorial will show you, I’ve looked over the beta of this pdf and helped develop it – I did not control the final outcome or have a say in what goes and what stays, though, and thus don’t feel my verdict is compromised in any way. That out of the way, let’s take a look, shall we? 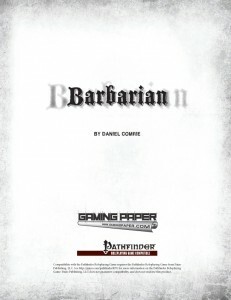 We kick off this pdf with a thoroughly well-written piece f in-game prose that gets one in the mood, detailing the hostilities between greco-roman seeming people and barbarians, before getting into the respective traits for barbarians – which take a surprisingly smart approach – whereas usually, traits are exchangeable minor bonuses with one-sentence explanations (and hence not particularly fun to read), this pdf takes a different approach – first of all, it determines several basic roles, the first of which would be non-adventuring barbarians. In boxes with a black background and white letters (not very printer-friendly…), we get the respective traits, in this first case bonuses to initiative under certain circumstances – the first one netting a +2 to initiative whenever you don’t have maximum hit points – which is not something I’d consider good design…always carry around that kitten for the 1 hp-scratch… On the plus-side, each trait, even beyond the description of the general role in barbarian society, comes with a full-blown description that makes the trait more than just a numerical bonus. Other traits allow you a bonus to will saves against spells and spell-like abilities of foes you’ve intimidated and another nets you, 1/day +1 round of rage if you hit a foe twice in melee in the same round – which is hard at low levels and later rather easy. While not particularly elegant design-wise, not broken either. More interesting would be imho a trait that lets you track creatures as if they’re larger or one that mitigates the fatigued condition’s penalty when using aid another. Changing facing upon defeating foes, being the last of your kind (and thus hardened to fear- and despair-effects) – all come with nice fluff. Another trait allows you to reduce the duration of the fatigued condition incurred by allies by 2 rounds (for fellow barbarians) or one round (for non-barbarians), but not fatigue with an indefinite duration. Getting 1/day plus one final round of rage when damaged in the last round of rage or receiving one free, non-AoO-provoking move action upon receiving damage, but before falling unconscious make for other interesting concepts via traits. Next up would be some simple archetypes, the first of which would be the Raider – raiders lose medium armor proficiency, but become faster, later get a bonus to dex and may use essentially a spring attack variant of charges – i.e. charge as a standard action and then move again in a straight line, not exceeding your double base movement. per se cool ability for wolf-pack style tactics, but *usually* moving through the square of an opponent requires an acrobatics-check and moving in a straight line through a target’s square doesn’t always make sense…just picture the gelatinous cube blocking the dungeon tunnel to get where I’m going. The second archetype would be the Auctor, who gets less rounds of rage, but instead gains a kind of favored enemy-style bonus against his own type (and later – other types). Okay, I guess. The Lusus Naturae takes a penalty to cha while raging, but may use this penalty as a bonus when intimidating and is a specialist at using the intimidating glare power. The pdf also offers three new rage powers: Death totem and its lesser and greater brethren – lesser death totem allows you to incite fear in foes hit in melee (or struck by your ranegd attacks), while its regular version allows you to ignore nonlethal damage, ability damage, energy drain and fatigue-themed effects while in rage and the greater version allows you to substitute 1d4+1 points of temporary str-damage for your regular damage – the latter might be considered too powerful, especially due to not requiring a save and stacking with itself. The pdf closes with 1 new feat, which nets you HP when you reduce a nonhelpless creature of HD greater than you to 0 HP – which means that in order to break this, you require kittens with metric ton of templates added – but it still can be done. A caveat of x/day uses would have helped there. Editing and formatting are good, though I noticed some minor glitches here and there. Layout adheres to a beautiful 2-column b/w-standard and the pdf has A LOT of text – you’ll get your money’s worth from this – the font is small. The pdf has no bookmarks, but doesn’t require them at this length. Author Daniel Comrie has crafted an interesting supplement – taking the (at least for me often) very boring task of reviewing trait-pdfs to a point where I actually enjoyed reading this – the traits and concepts herein resound, are inspiring even, and the prose can be considered neat indeed. Now crunch-wise, the pdf isn’t particularly elegant in some cases, with slight ambiguities in the wording/rules and similar hick-ups. Now that doesn’t mean the pdf is bad – quite the contrary: Design-wise, a lot of damn cool things are done with traits, often offering more than a bland situational bonus on roll xyz that we’ve come to expect from (and be bored by) traits. I’m in a bit of a conundrum here – on the one hand, this pdf tries very hard to be innovative with one of the most yawn-worthy components of character design and succeeds. On the other hand, it also has some serious rough edges that should be addressed. How to rate this, then? In the end, I will settle on a final verdict of 3.5 stars…but have to round down to 3. I still encourage you to check this out – the prose and design-ideas to scavenge are rather interesting, and hope the author will continue to try to do interesting things with traits.